I am NOT a patient internet customer. I enjoy quickly receiving things that I order and have even signed up for the free trial of Amazon Prime to sate my desire for internet goods and services! My patience was tried for a record 255 days when I backed my first KickStarter project for the BosaviTM headlamp. In this quick review, I’ll note my reactions and field test results from a 14 mile snow shoe overnight trip to Twin Lakes on Mt. Hood, OR. I’ll also note whether this product was worth the wait (and weight) provided by the manufacturer. Before I start this review, I’ll note that I have myriad headlamps ranging from the diminutive Petzl e+LITE to the robust SureFire Saint Minimus. The latest addition to my collection, apart from the BosaviTM, was the Petzl Tactikka XP Adapt which I use primarily as a waist lamp for night hiking given its forward-facing flood beam. From everything that I read about the light, it was very light weight at 2.1 oz (roughly 2x the e+Lite), had a powerful beam at 110 lumens (10 lumens more than the Surefire) and could be used as a waist lamp. Not only that but it was rechargeable with packaging that could be fashioned into an origami lantern for use in camp. What was there not to like about this headlamp?! I’ll note that this was far longer than anything that I had ever waited for, including custom gear from MLD, Six Moon Designs and ZPacks. The only consolation in this wait was the level of transparency managed by Dan Freschl. During the process, Dan shared everything from die cutting to injection molding to PCBs. There was a unique sense of satisfaction knowing that my investment in Bosavi would help bring a great idea to fruition, even if I’d never actually seen the lamp in person! The contents of the packaging for the headlamp included the following: 1) a clear recyclable sleeve printed with the product name/logo and information, 2) convertible packaging ‘box’ material that is used to create the lantern, 3) one elastic ‘hair band’ that affixes the headlamp to the packaging (used to attach the lantern to the headlamp) and 4) one double-sided set of instructions for assembling the lantern and programming the headlamp. The packaging is ingenious and very environmentally friendly. The only waste comes from discarding the bits of the package that aren’t used for the lantern. I consider this to be minimal and note that this is easily the most environmentally-friendly product that I’ve ever purchased. The only issue that I had with converting to a lantern came in two areas: 1) the perforations were not easy to tear without the use of scissors and 2) the printed instructions, complete with pictures, were somewhat difficult to execute. The first issue could result in a torn lantern if you’re not careful with the assembly. The second can result in a frustrated customer as I didn’t catch the need to make the horizontal folds against the direction of the diagonal folds. This caused the lantern to look nothing like the origami masterpiece from the Bosavi website and I had to revisit my folds to get it to look right. I don’t consider this to be significant as there are multiple individual videos on the website to do this, but it doesn’t provide a perfect ‘user experience’ out of the box in my opinion. Any self-respecting ultralighter cares about weight. The product page notes a weight of 2.1 oz. Per my digital scale, I weighed the lamp, including strap but excluding the lantern as 62g or 2.19 oz. Technically this is a 4% measurement error, I expect, between the prototype and the finished product. I expect that Dan will correct the specs based upon the finished product. The charging process took a little over an hour to complete. When plugged into a USB port, the red LED flashes indicating that the unit is charging. When charging is complete, it changes to a flashing white light. I found this to be very intuitive and way more so than other consumer electronic devices. Due to a minor color blindness, I often find it difficult to discern the difference between small green and red LEDs. The way that Dan has handled this is ingenious and intuitive. Man was I impressed using the headlamp in the field. It was the brightest headlamp vs. my two hiking buddies. The spot beam, a Cree XP-E LED, is very powerful and bright. I found that I was able to use the efficient white LED in most situations, but I’ll note that I was not night hiking. I found the lantern really easy to use in the field. It can be attached around the headlamp with the strap folded across the bottom as well as around the headlamp itself so that the lantern can be hung. I suspended the lantern from the strap in my shelter and it provided enough light via any setting. My favorite lantern settings were the ‘Bright RED’ LED and the ‘Efficient white’ LED for this purpose. The headlamp worked like a champ in the cold (~25 degrees Fahrenheit). I had zero issues whatsoever! As I noted above, I’ve tried (and own) a ton of headlamps. While certainly not the lightest headlamp that I own, it’s certainly the lightest for its robust feature set. Relative to the Petzl E+Lite, it has myriad more settings and is far brighter and less prone to hinge failure. Relative to the SureFire, it has a brighter beam in a lighter package. I’m unable to compare it to the Tactikka at this point as there’s currently no solution for using as a waist lamp (although Dan notes that there will be a solution for this in the future). I expect that it will not fare as well for this purpose due to the downward angle of the beam and what I perceive to be a lack of a ‘floody’ beam. The latter, I’ll note, can be simply addressed via a filter. The unit itself is very svelte and easily the smallest ( & lightest) rechargeable headlamp in the market today. The construction is solid and very well made. There’s a removable plug that covers the mini USB port which makes the device itself highly water resistant. Relative to other market offerings, this is the most simple design that I’ve seen without a bulky battery pack, multiple unsightly attachments and bulk. The modular design is also impressive which allows the headlamp to be attached to a bike mount, a hip belt attachment, etc. This is very inventive and, as I note above, is planned to be improved with multiple attachments in the future. I’ll revisit this review after I use the headlamp over an extended period of time, including bi-weekly early am hikes in the dark. Once a solution is available, I will also test as a waist lamp, which is my preferred setup for night hiking. This will include commentary on the battery life and water resistance as well. You will soon be able to order this headlamp via the webstore at the Bosavi website! Kevin’s posture suggests that he may need to adjust his load and pack his postgame meal and other heavy items directly between his shoulder blades: this will provide greater load balancing benefits from his pack’s sternum strap, ideally replaced with the Most Awesome Sternum Strap I.T.W. from our friends at Mountain Laurel Designs. A smart move would be to attach an ultralight pack cover such as the Sea To Summit Ultra-Sil (small) which would ensure that #35 could quickly adjust to any unexpected mid-postgame interview precipitation he might experience. Lastly, to help with those really long press conferences I would recommend that Kevin swap out the stock back panel insert for the Therm-a-Rest Z-Seat, which would simultaneously improve the comfort and reduce the weight of his pack, while increasing the total utility of his gear. 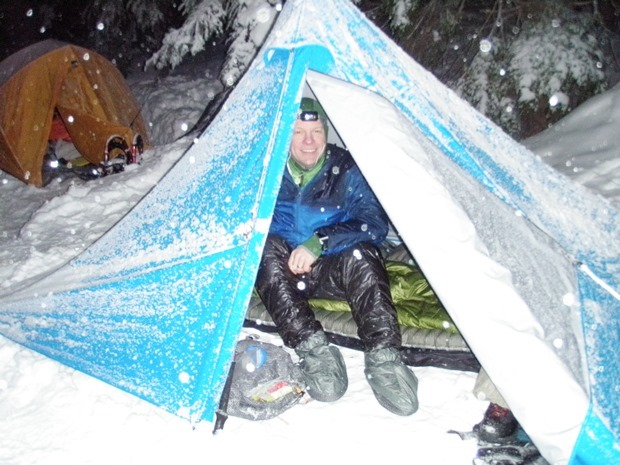 Good luck on the dais Kevin, we hope to see you back on a Pacific Northwest trail soon.